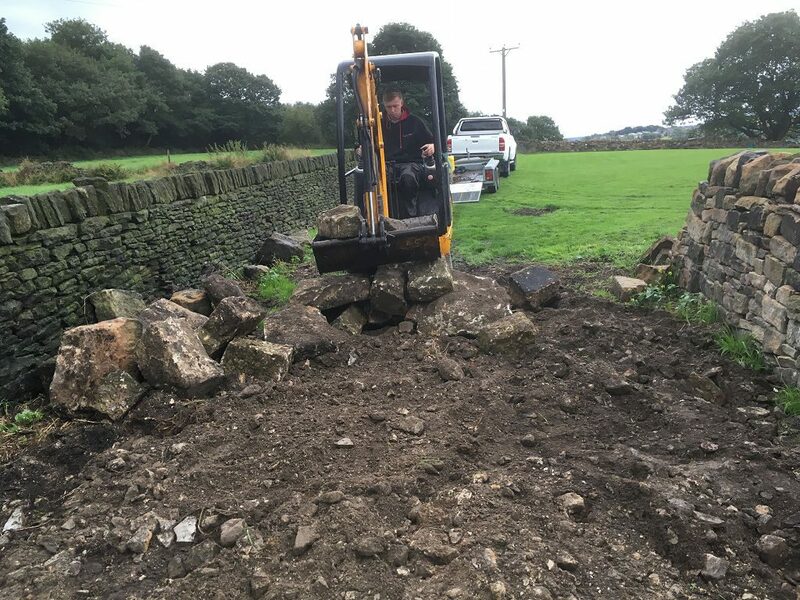 In order to use up some of the left over stone, we decided to build a “sheep pen” in the top field to house our dumper and other bits and pieces. 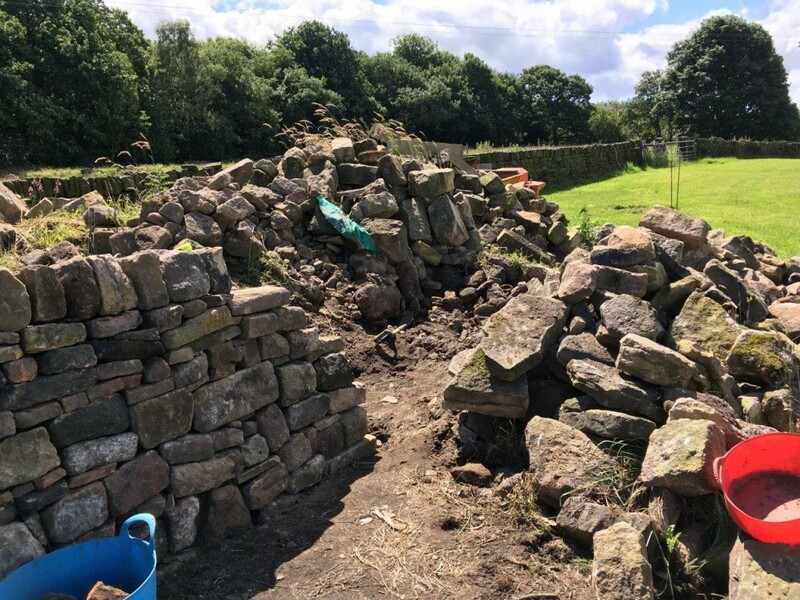 Part of these walls have been built through the mountain of stone by building the wall a section at a time – we have been moving the stone from in front of us to build the wall. This in turn allows us to dig the footings for the next section and the process starts all over again. Laborious, but it works! 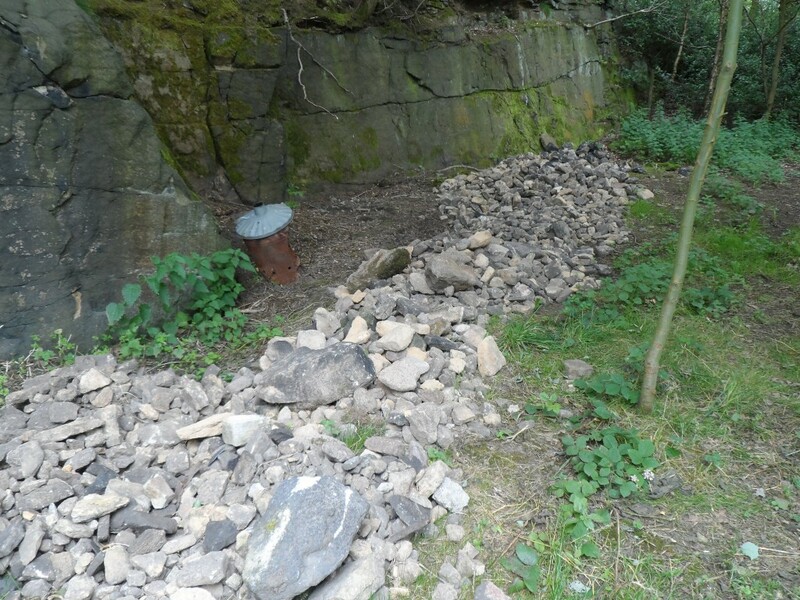 It was a bit daunting when we started this job, but at least the stones didn’t have to be moved far! We came out about 4m from the existing wall (and at the same height). Now it is time to turn the corner! 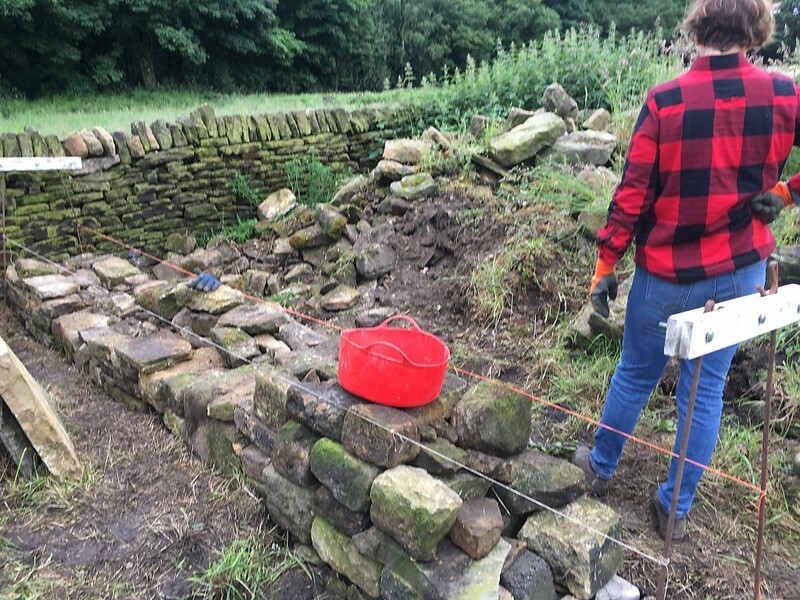 We built this wall about 1.5m at a time – each time digging the footings by hand and then taking the stones from in front of us to build this wall. This way we managed to build the wall “through” the mountain of stone. 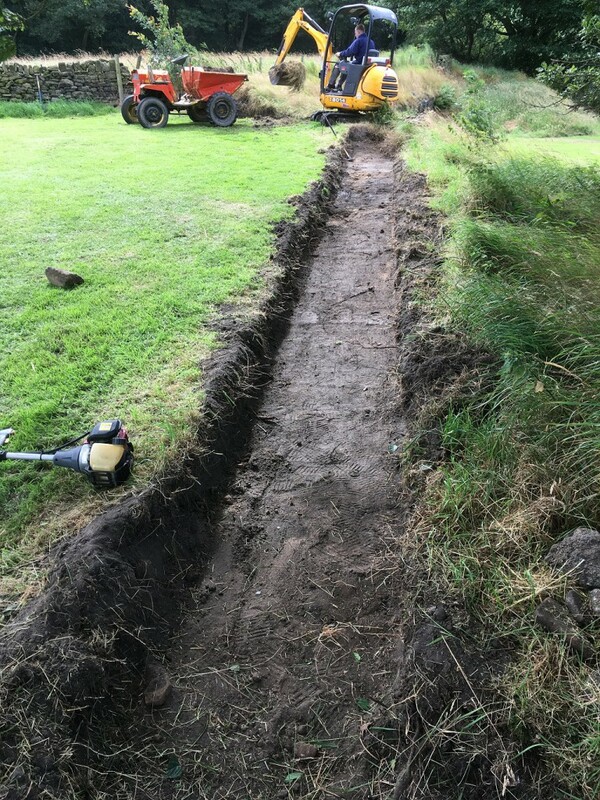 The foundations of the wall are built on top of the subsoil – we dig a trench to remove all of the turf and top soil. 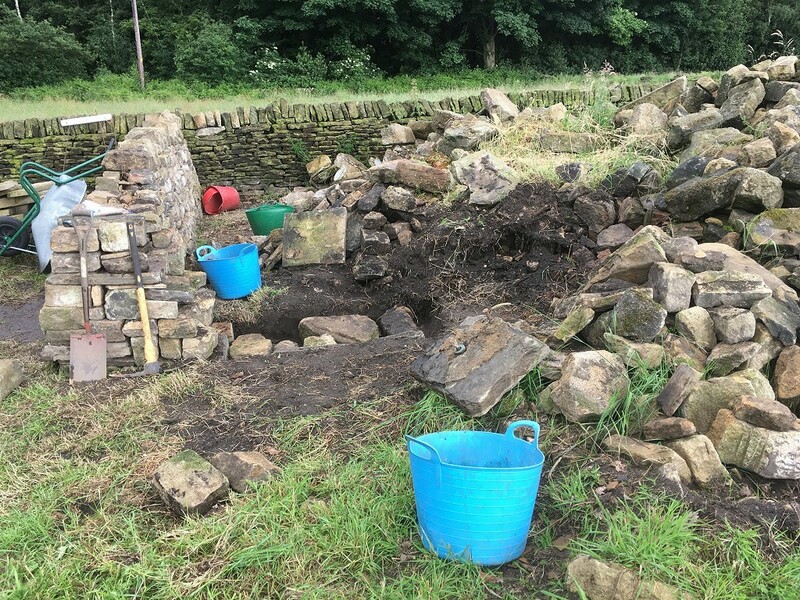 This means that the foundations are out of sight – this is a good place to loose some of the old bits of concrete block and old bricks. 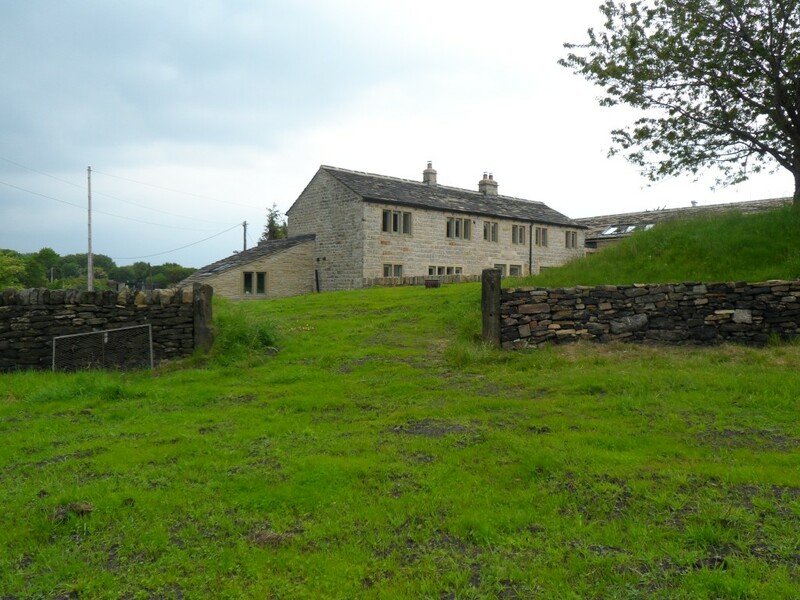 It provides a good solid base without using up good stone. 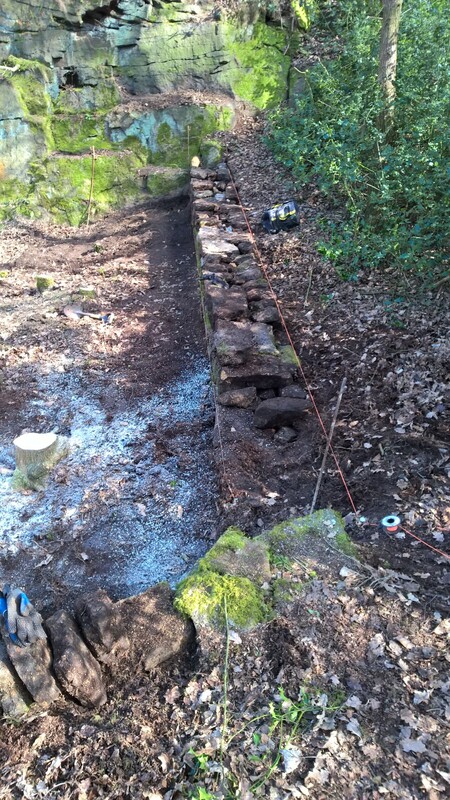 The footings are all dug by hand. The buckets are full of smaller stones that are used to “pack out” the middle of the wall. 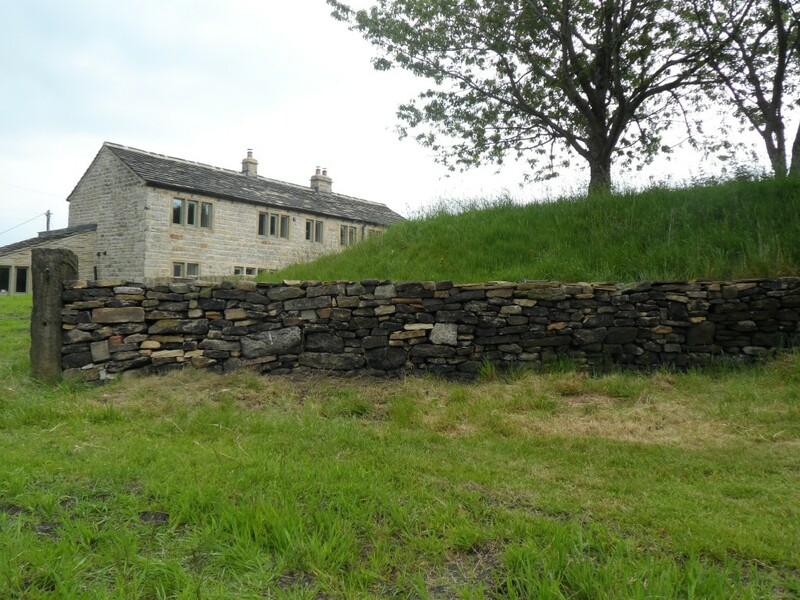 You’ll be amazed at how much stone can be used up doing this and how stable the smaller stones make the whole structure. 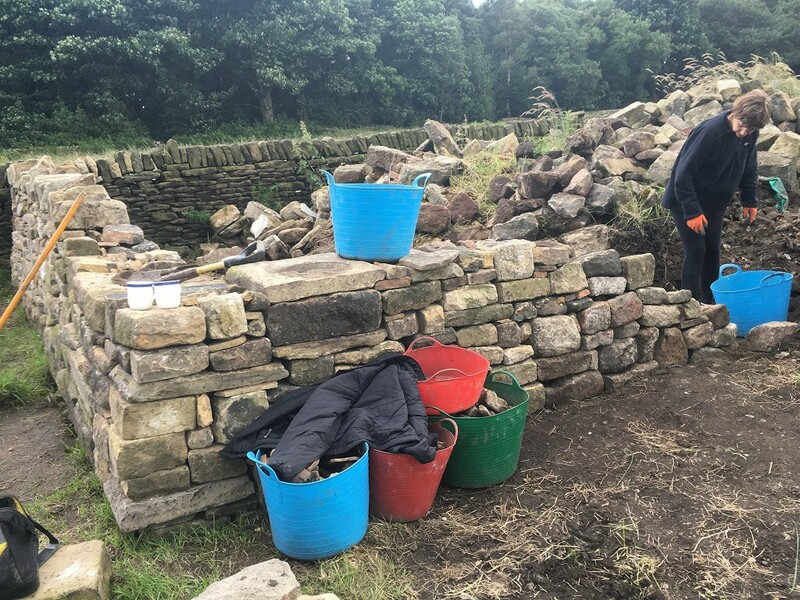 While I get to put the bigger stones in place, Jo gets to work fill the centre of the wall behind me. We progressively worked our way building through the mountain of stone. You can see where the “mountain” used to be because there was no grass under the mountain. We are now using some orange string to provide a guide for the top of the wall. 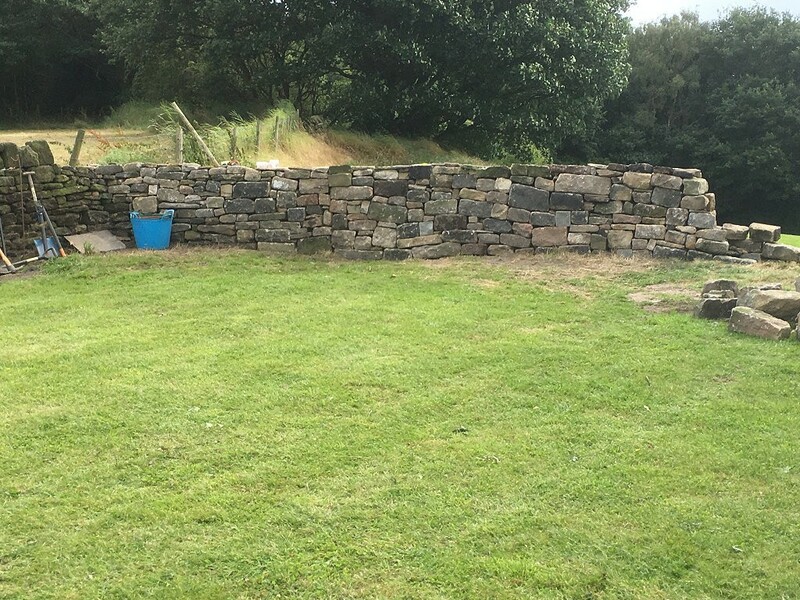 Our aim is to build this wall to the same height as the old wall behind. 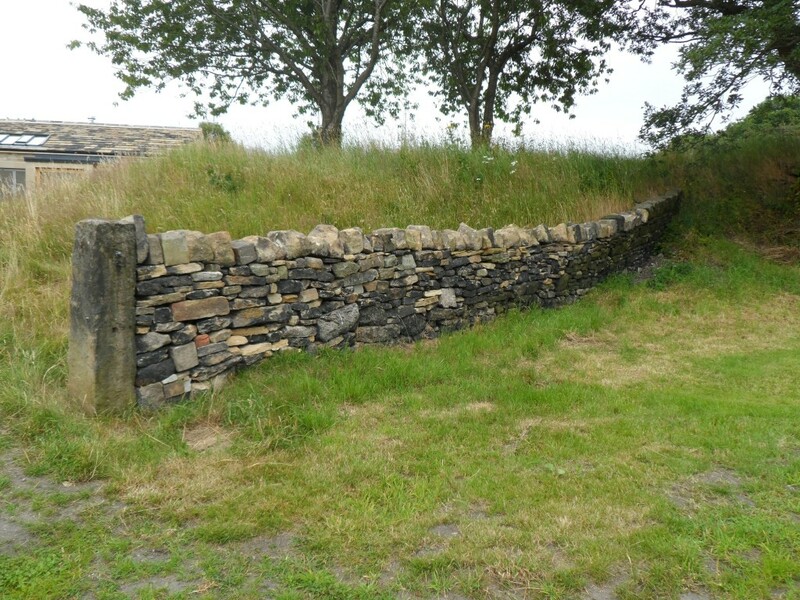 We are going to stop building the sheep pen and turn our attention to building the wall along the top edge of the field. If we have any stone left over, we may come back here and build out the pen a little more. But for now, we are done here. 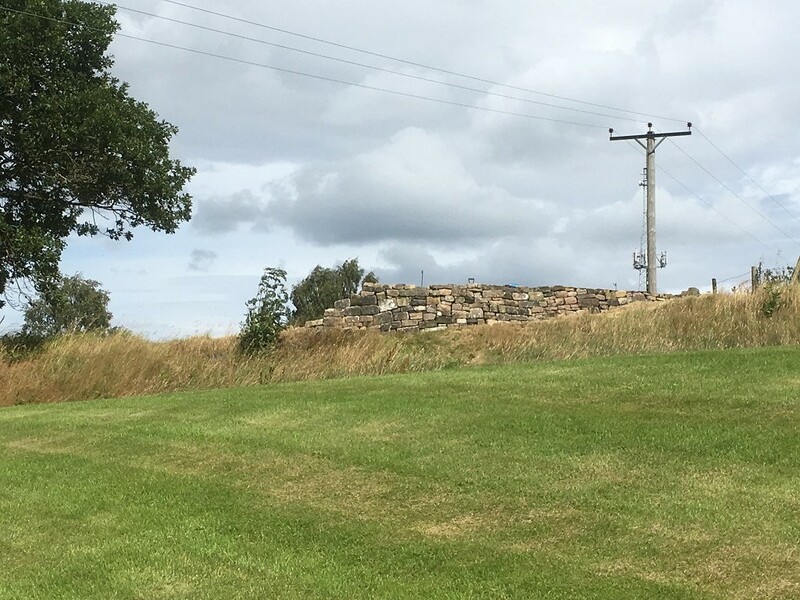 You can just see the top of the stone pile behind the wall. 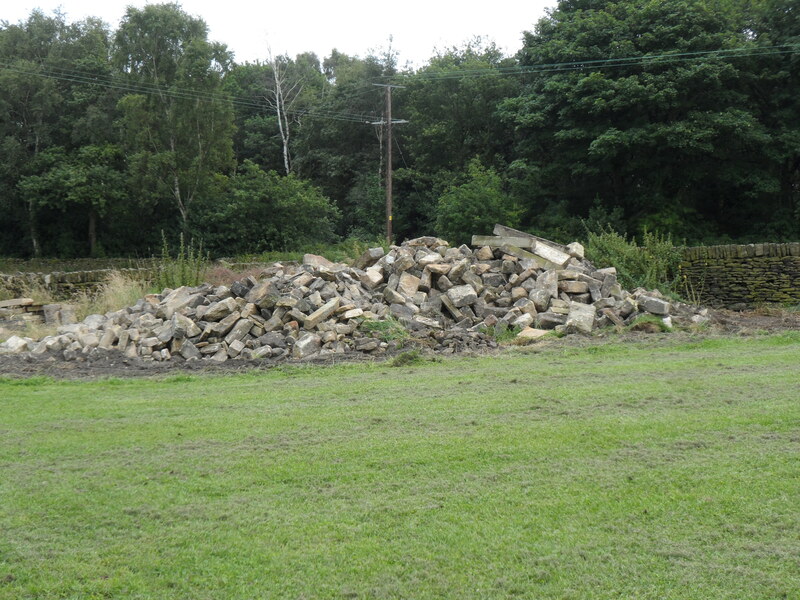 We had a real mountain of stone left over when we demolished the old barn. 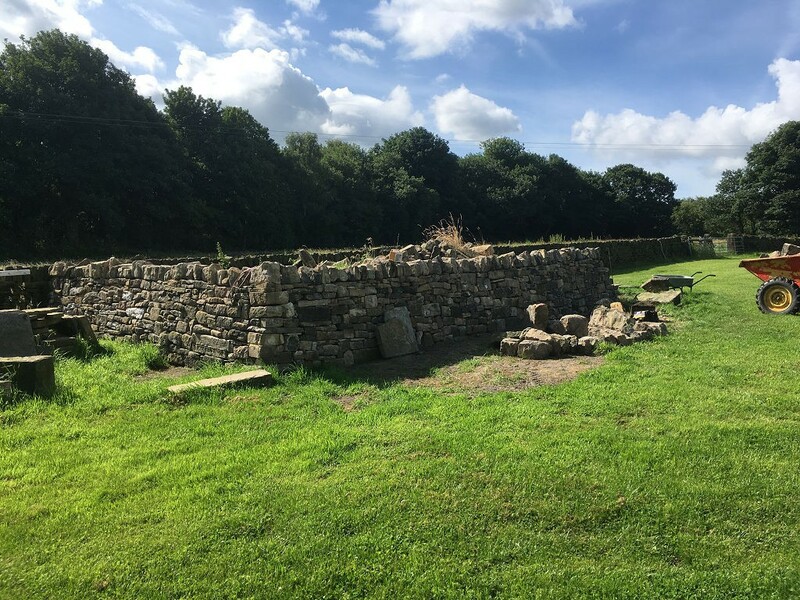 It was of little use when re-building the extension, but since it had been here for the last 200-300 years, we didn’t really want to get rid of it. 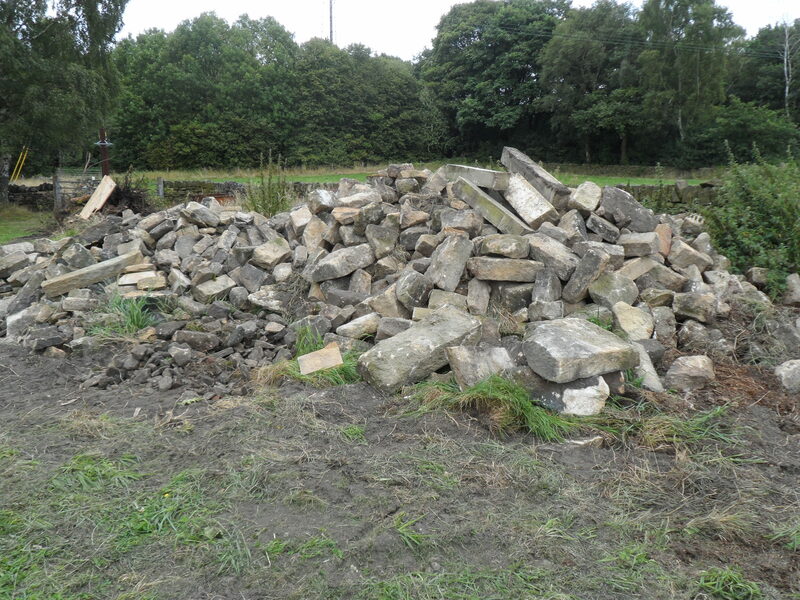 So the big question is what do you do with around 250 tons of old stone? 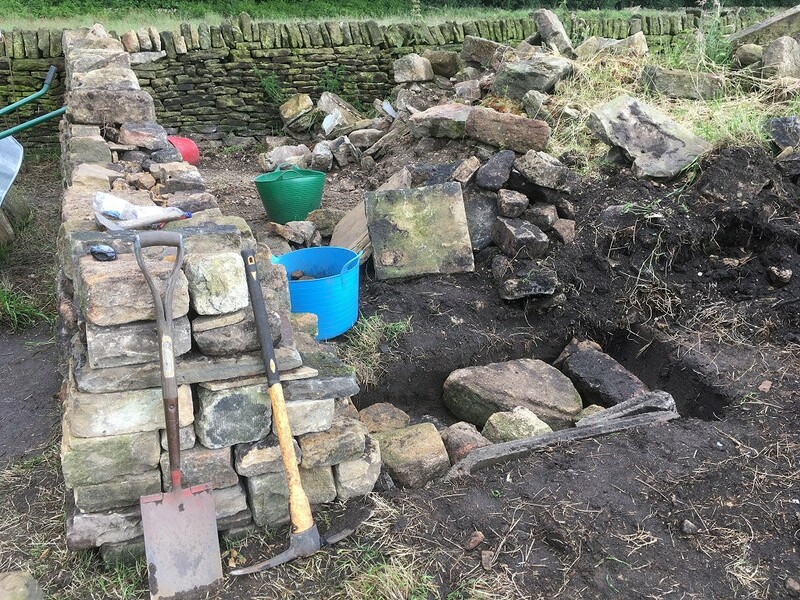 We are still “raiding” this pile of stone left over from the renovation to rebuild and repair different bits of our dry stone walls. 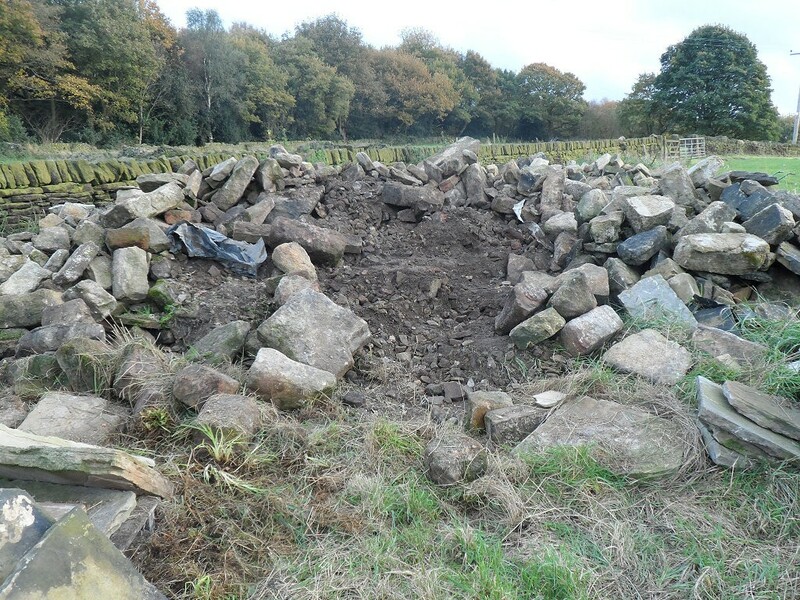 Our first call was to build a “sheep pen” around the mountain of stone. 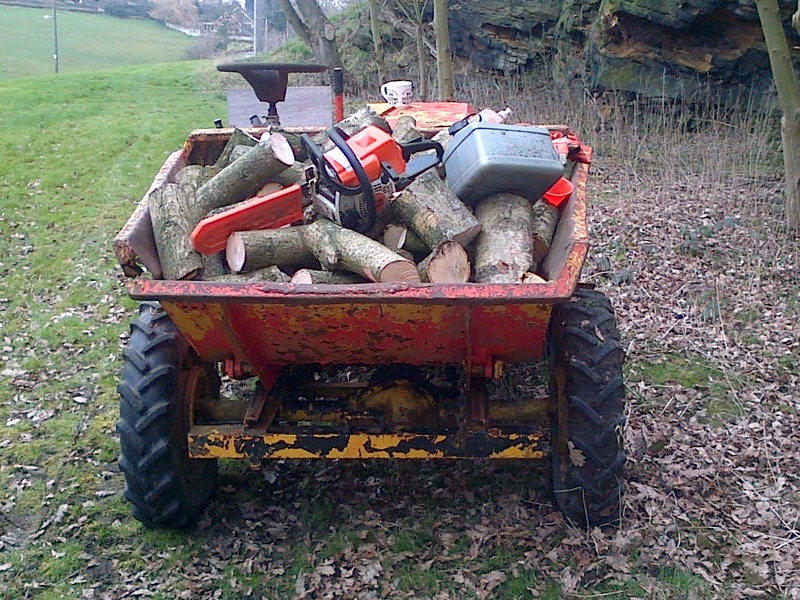 This would give us somewhere to park various bits of machinery where it was out of site. In the short term, it would also be a good spot to store horse manure/compost. And who knows, eventually even some sheep! 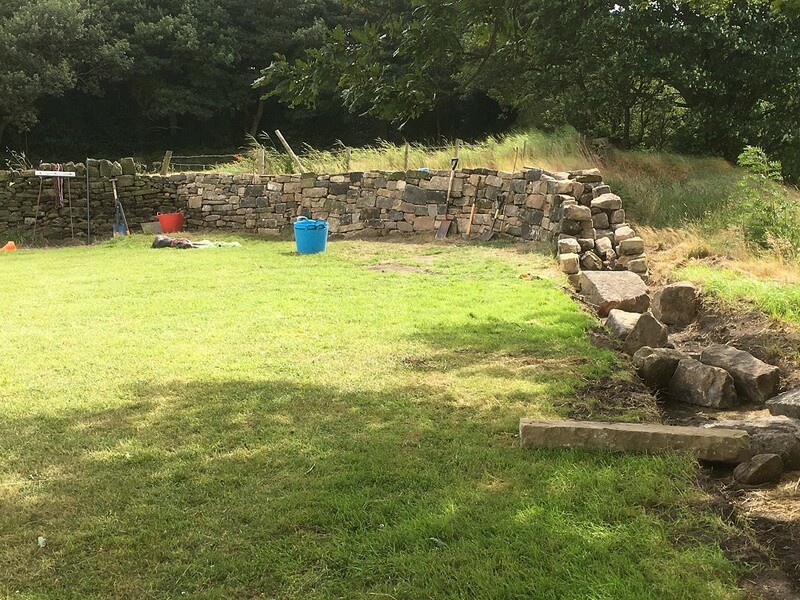 The next step was to re-build the wall in the top field along the boundary with the lower field. 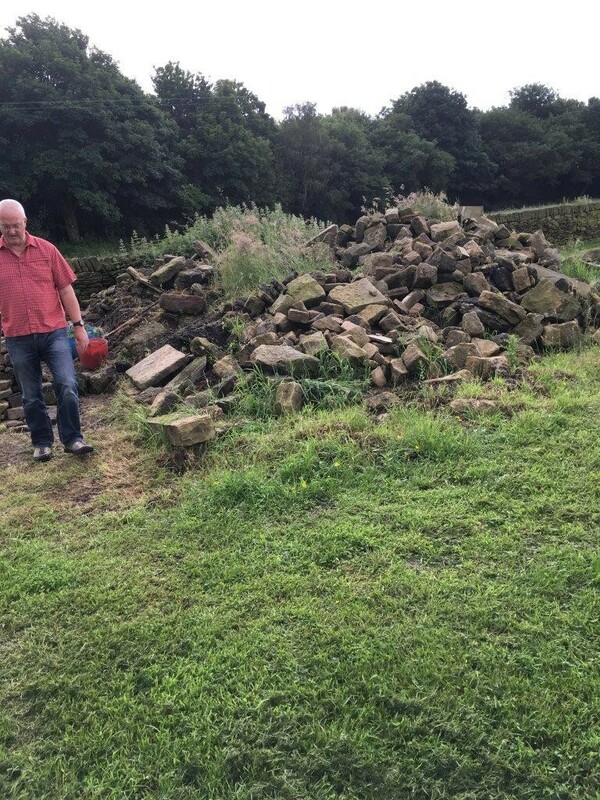 There had been a wall here previously, but I suspect that it was built a little too close to the edge of the escarpment and it just end up as a pile of stones along the edge of the bottom field. This old wall can still be seen in places. The new wall is just a little back from the edge, so hopefully the same fate will not await our new wall. 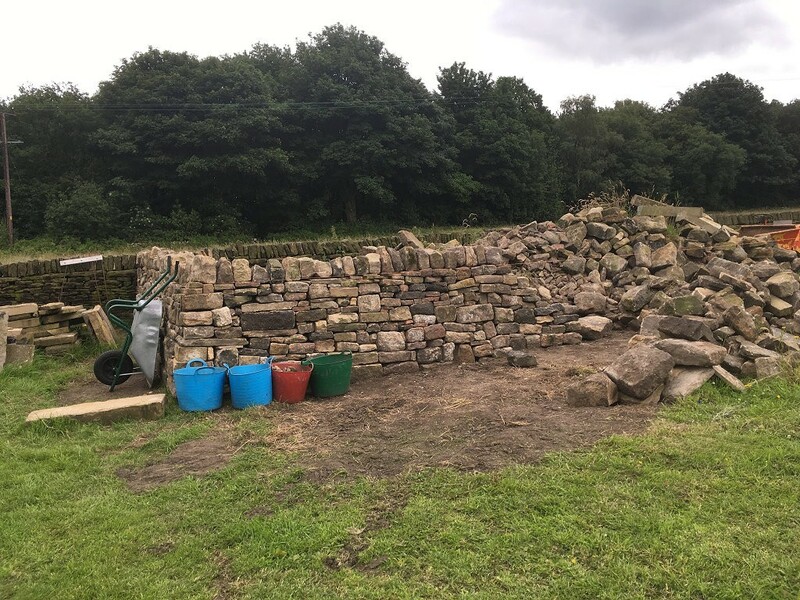 I reckon by the time that we have finished this wall that most of the mountain of stone will have disappeared (or rather, been repurposed!). 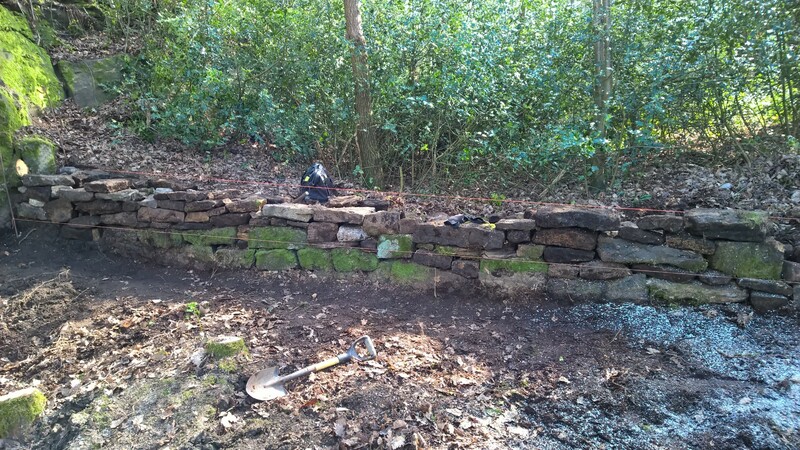 It needs some coping stones, but the wall in the bottom field is done. We have been working on it for the past couple of weeks. 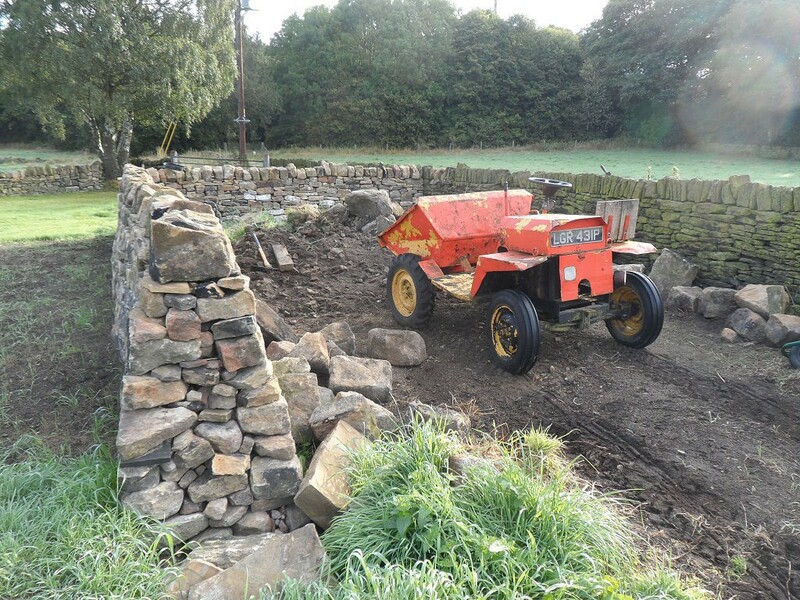 We have been using the opportunity to use up some of the stone left over from the renovation and although we have used 4-5 dumpers worth of stone, there still seems to be a lot of stone still left. 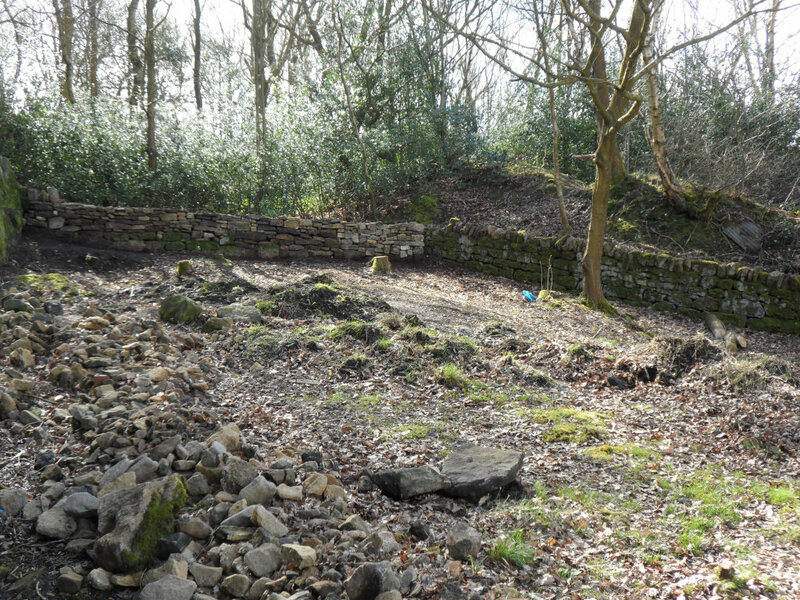 We aren’t sure what we are going to with this area, but now that it has been tidied up, it is a lot more accessible. 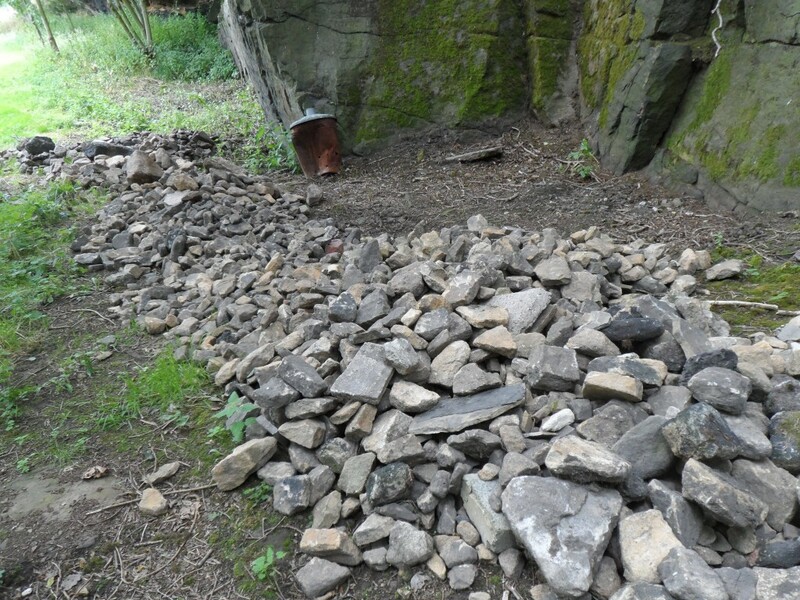 The loose stones need sorting out, but we can’t make up our minds about whether we should do this by hand or hire a machine. The ground is still too wet to get a machine in here. 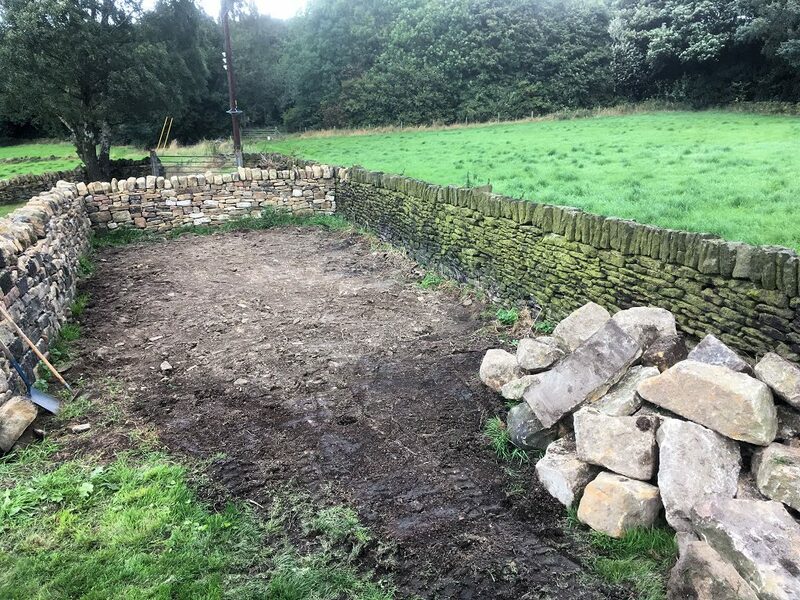 You can see where we have used new stone from our pile, but give it 12-18 months and it will looks as if this wall will have been here for years. 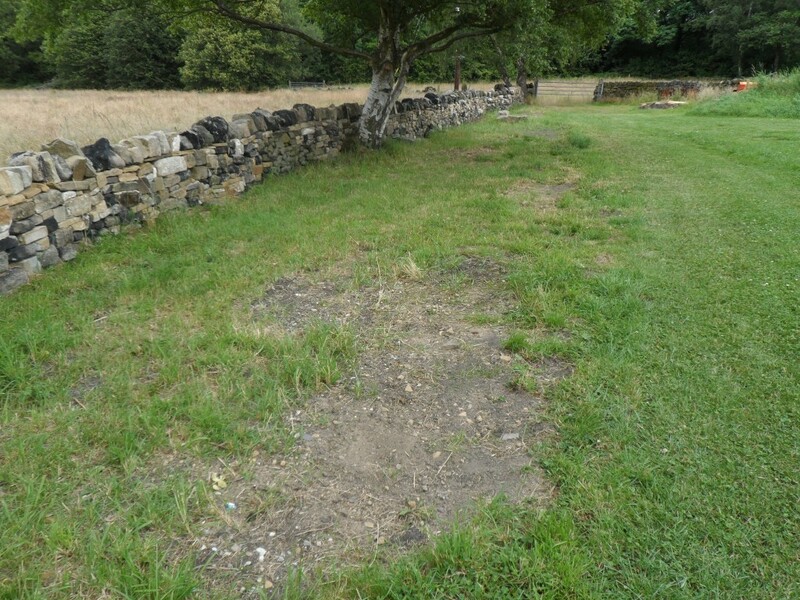 We are constantly amazed as we look back at other bits of wall that we have repaired about how quickly they seem to age (just like me). Just needs a bit of clearing up and the ground needs a bit of levelling, but when we first bought the property this was completely overgrown. Well, almost done. Just needed some coping stones along the top. Some of the bigger pieces here are going to require a machine to lift them. 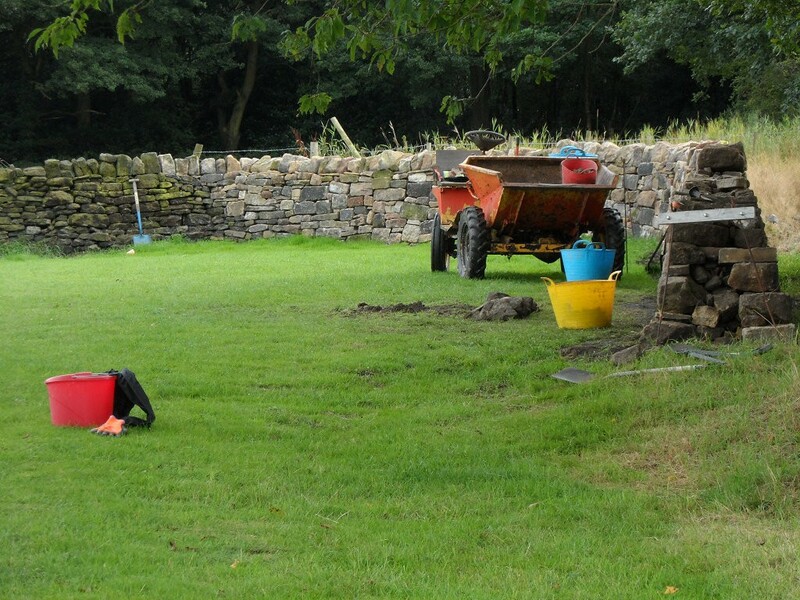 We managed to get half a day today once the rain stopped to finish off the wall in the bottom field. We started on the wall on the right hand side of the gate a couple of weeks ago. There wasn’t a wall here previously, just a gate post. 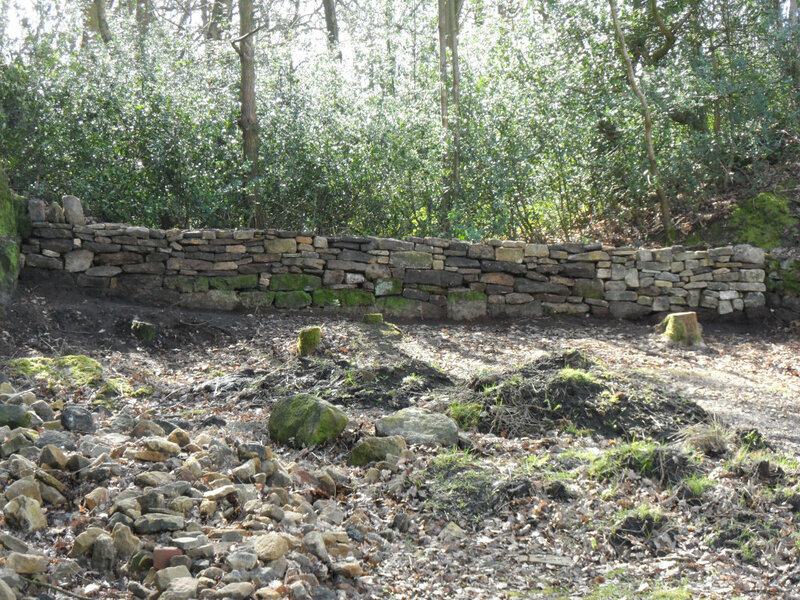 We have used all sorts of odd stone from around the property to build up this wall. 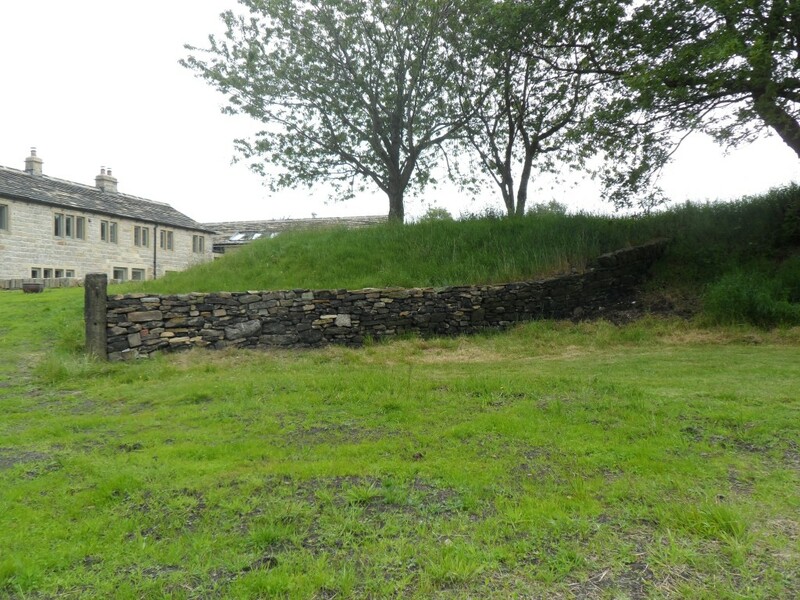 In fact, it has been a good way of getting rid of quite a lot of stone. Once it all weathers in, it will look as if it has been there forever. 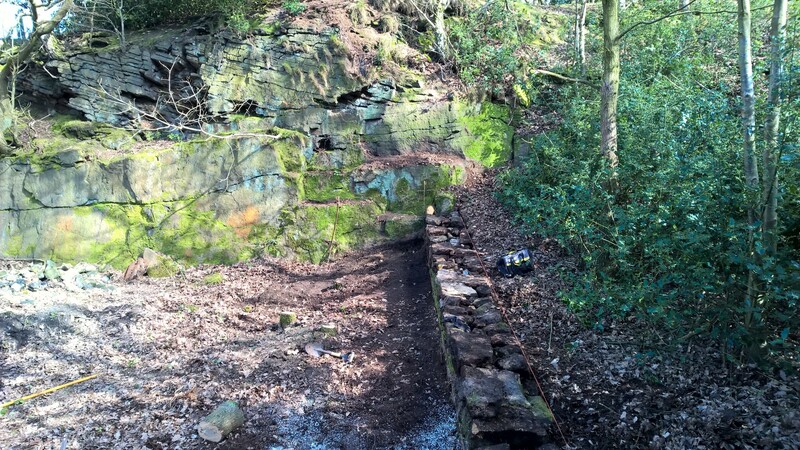 The rain stopped this afternoon and this gave us enough time to finish off the wall that we started on a couple of weeks ago. We just need to find some coping stones now.